We are a team of pipe organ builders under the guidance of David Wintle as Managing Director, offering our services throughout the country and beyond. His wife, Pamela Wintle, works alongside him as Director and Company Secretary and their son, Christopher Wintle is also a Director working full time within the company. Based in the South East and Monmouth, we have over 250 instruments in our care for routine tuning and maintenance. David completed his apprenticeship at J W Walker & Sons Ltd back in the early 1970’s. He went on to work at Mander Organs for over twenty years, carrying out tuning and maintenance, mainly in London and the south east, including St Paul’s Cathedral and Canterbury Cathedral. During his time at Mander Organs he also worked on prestigious organbuilding projects such as The Royal Albert Hall and Birmingham Town Hall, as well as overseas installations in Oman, USA and Nigeria. An interesting highlight of that time was the dismantling and removal of an organ from the late Rudolf Nureyev’s Paris apartment for the subsequent London auction of his estate. In 2002, we decided to set up our own company specialising in tuning and maintenance under David’s direction, and established Mander Organs (Tuning) Ltd. In 2015 we took the exciting step of relocation and decided it was time to trade under our own name thus Wintle Organs (Tuning) Ltd was born. Christopher grew up with organbuilding in his genes and was assisiting David from the moment he could walk! He was employed for a time by Mander Organs as David’s tuning assistant and has been integral in setting up and running Mander Organs (Tuning) Ltd and subsequently Wintle Organs (Tuning) Ltd. He has now taken over the bulk of our tuning and maintenance work as David steps back and oversees the work in an advisory capacity. Christopher’s tuning portfolio includes several City of London churches, Canterbury Cathedral, public schools including Eton, Harrow and Winchester, historic and well-loved instruments in country parishes and an annual maintenance visit to The Cathedral of St Mary Crowned, Gibraltar. Hamish joined our team in early 2016 to assist Christopher and add his own expertise gleaned from his background in music technology, recording and composing as well as his childhood choir career. Together, Christopher & Hamish are proving an invaluable professional team. Wintle Organs also has access to many highly professional associates should the need arise. This gives our company the flexibility to handle jobs both large and small in many locations. Wintle Organs is a Business Member of the IBO currently accredited in Tuning & Maintenance and Cleaning & Overhaul. 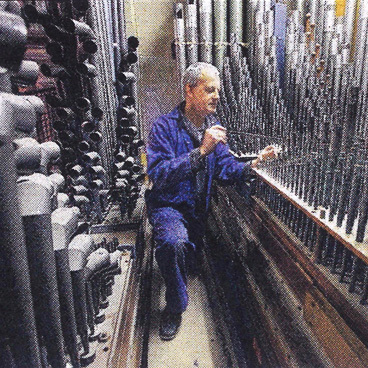 Wintle Organs have been involved in the maintenance, cleaning and refurbishment of pipe organs since the 1970's, and we pride ourselves on our attention to detail and our personal touch.